Crow and Sunflower by Silver RavenWolf. Crow/Raven Pattern – 6 Projects! Intelligent, clever…the purveyor of power within to conquer any goal, to dispel any block…genius, guardian of mystery…keeper of the magick. Learning to control, understand, and acknowledge our shadow selves. The gathering of the group mind. For two years I kept hearing this strange sound, like someone stepping on a rubber duckie, as I worked outdoors on our property. I knew it was birdsong, but I could not find the source. I would sit silently for hours by my bird feeders, attempting to ascertain who was making that odd noise! I observed several birds — the Woodpecker, the Titmouse, Catbird, Finch, Chickadee, Cardinal, Bluejay, and several others. None of them made that strange and interesting sound. I finally sat down and went through the http://pa.audubon.org/birds website and listened to all the native Pennsylvania bird calls to discover the owner of the rubber duckie music! To my amazement? It was the Fish Crow! I’d never known there was such a bird! Of course I knew about crows — but, a Fish Crow? How interesting! This past winter, several of these birds roost in the woods just past the property line, and I can hear them late at night, as they find safety from the owls in the trees. These birds remind me of the group mind, protection for the home, and the sharing of information within a community. Felt – Bird on a stick, a bookmark, an altar cloth, and a brooch. The following pictures show the different ways I used the pattern. Herbal formulas and enchanted washes varied with the purpose of the bird, although I used the Universal Fluid Condenser on all the birds (see my book The Witching Hour for instructions on making the fluid condenser). I also created enchanted washes from steeped herbs and spring water. Once cool, I used these washes on both cloth and clay. Washes are a great substitute if you can’t add the herbs directly to your project. The downside of this type of dressing lies in the speedy dissipation of the wash — which rubs off or disperses quickly, losing magickal moxie in about 30 days unless the cloth was soaked from front to back in the wash (which isn’t always possible). Should you wish to speak to the dead, add myrrh and dirt from a beloved ancestor’s grave. You might also choose to add found feathers to your sachet or herbal bag, as well as the astrological planetary glyph for Mercury. 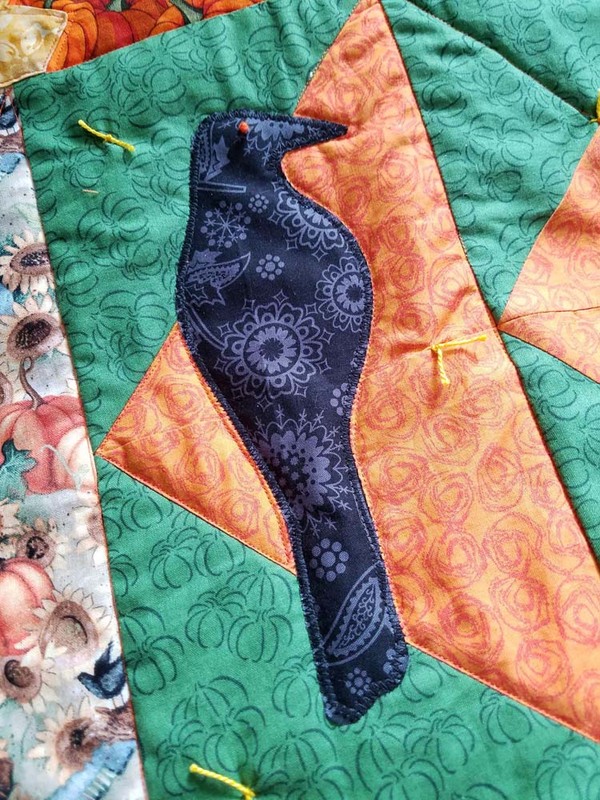 I’ve provided the pattern in three sizes — I used the largest for the felt bird shown in the photograph at the beginning of this article. Here is the brooch pin made out of felt, the bookmark also in felt, and the car visor clip constructed from clay and painted clothespins. From left to right — car visor created out of clay with clothespins glued to back, brooch pin made of felt with sewn-in pin back and bookmark made of felt, heavy stabilizer, and black elastic. Prim Raven is constructed out of muslin, soft-sculptured with needle and thread for wings and tail, painted, sanded, and then grunged with cinnamon and nutmeg. I added painted clothespins to the prim raven so I could hang him on a decorative tree branch in a floral display. Using cotton fabric, I created an applique for a late summer themed quilt. Here the pattern was used to create a success altar cloth — made from felt and Perle embroidery thread. Stitch pinback to your felt bird to create a unique brooch. Roll clay to 1/8 inch thick and use a sharp knife to cut out your raven. Smooth edges. Add additional indentations using clay tools. Bake as indicated by type of clay used. I glued a painted clothespin using E6000 Glue to the back of the bird fashioned from clay. I picked up all the supplies for this month’s projects at a craft store using only sale and deeply discounted items. Cost is always an issue for magickal crafters and I wanted to show projects completed using what I could find — a tribute to the raven who always discovers wonderful shiny things! The bookmark was my favorite application of the pattern. I used 1/4 inch wide black elastic. Wrap the elastic around the book size you like best as your measurement. Cut out two birds from black felt (front and back). Cut out a smaller rendition of the bird from heavy Pellon stabilizer. Sew ends of elastic together, then stitch onto the stabilizer. You can write your magickal charm right on the stabilizer with indelible ink pen. Sprinkle with herbs. Spray with universal fluid condenser. Allow to dry. Lay the stabilizer on one bird piece, sandwich with the other felt bird piece. I stitched by bird together using Perle embroidery thread, then I added the chakra wheels with additional felt pieces. I hope you enjoyed the various uses for your Raven/Crow pattern! Be sure to visit me at http://www.whispermagick.com! Don’t miss visiting with me at The Crystal Fox in Maryland on April 22nd, 2018! I love this crow pattern, beautiful designs.thank you for sharing. Always Our Raven Brings the Best to our world. Thank You!!! Thank You so much for sharing! I really love your witch-crafts! BB! Merry meet, Silver. Thank you for your inspirational ideas. You always give me something to look forward to. Blessings! I can’t wait for your new book!